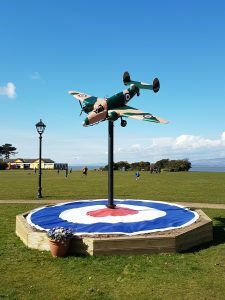 On Sunday 1 April 2018, to celebrate the 100th birthday of the Royal Air Force, a new feature was unveiled on Silloth Green. 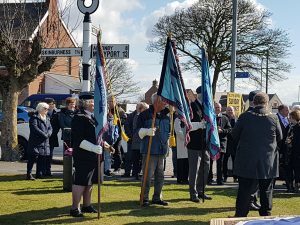 Councillor Tony Markley, Mayor of Silloth welcomed everyone to the ceremony which was well attended, with a broad range of people from Silloth and from further afield, on what was a lovely Spring day. He talked about the Hudson Bomber project, about Silloth’s history and the role of the airfield during WW2. Silloth Airfield was opened in June 1939, just before the start of WW2, and closed on 31 December 1960. It was originally designed to be used by RAF Maintenance Command, 22MU, but was handed over to Coastal Command during November 1939. No1 (Coastal) Operational Training Unit (OTU) was responsible for training pilots and crews from the UK and Allied countries. 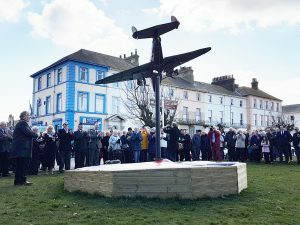 To celebrate the town’s involvement in WW2 and to support Silloth’s ‘in Bloom’ activities, Silloth Tourism Action Group had the idea of a permanent structure based on the shape of a WW2 Hudson plane. Cllr. 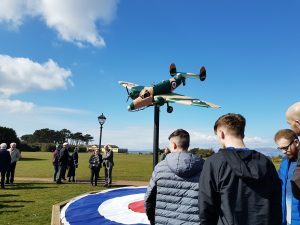 Markley approached Gen2, the Cumbrian training provider at Lillyhall, to enquire if their talented apprentices could construct a replica Lockheed Hudson plane, as one of their annual projects. The apprentices successfully built the plane which was put on display during Apprentices week in March. Gen2 has been named Apprenticeship Provider of the Year at the inaugural Annual Apprenticeship Conference which is a brilliant achievement. 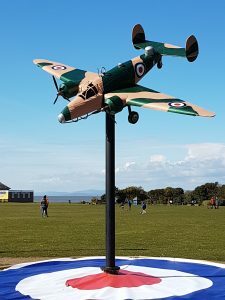 The plane has been gifted to the people of Silloth and is a welcome addition to the Green. 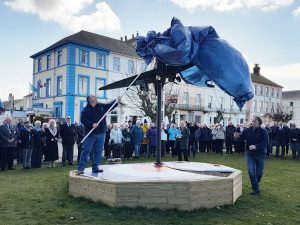 The plane is sited above a new raised flower bed, built by the Town Council’s grounds maintenance team, to be planted up with colourful summer bedding in the shape of an RAF roundel. The new feature is sited opposite the Silloth RAFA club on Petteril Street which is the only remaining RAFA Club in Cumbria. 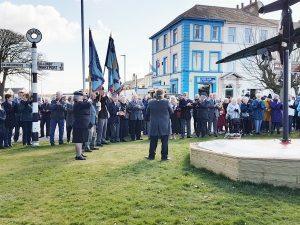 The RAFA Association was well represented at the ceremony, with members from Silloth, Penrith, Cockermouth and Carlisle branches in attendance, displaying their Ceremonial Standards. Representatives from RAF Spadeadam were also at the ceremony. 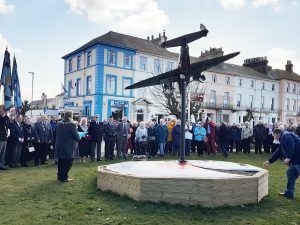 The project has been funded with a Community Grant from Cumbria County Council and a kind donation by the family of a former aero engineer, Rex Morris, who served at 22MU Silloth during the War. After the plane was unveiled, a moving poem entitled ‘Hudson Bay’ written and narrated by Tim Barker was played over the PA system. Tragically, a large number of Lockheed Hudson aircraft and their crews, who had crashed during take-off or approach to the wartime airfield of Silloth ended up in the Solway, resulting in it being renamed locally as ‘Hudson Bay’. Refreshments after the ceremony were provided by Silloth RAFA club, with a specially commissioned cake to celebrate the 100th birthday of the RAF. Thank you to everyone who attended the event yesterday and a special thanks to everyone who played a part in making this project happen.